The bar at the new Del Mar in the Marina. Photo: Del Mar. The communal table at Del Mar. Photo: Del Mar. The new Almanac Barrel House and Taproom in Alameda. Photo courtesy of Almanac. 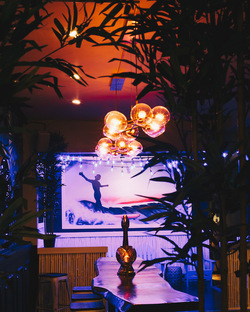 Over in the Marina, the former HiFi Lounge has been reconcepted and redesigned into ~DEL MAR~, a tropical oasis. Partners Max Young (Mr. Smith’s, The Bamboo Hut, McNally’s Irish Pub, and The Reel Fish Shop and Grill) and Michael Wilbert (Mr. Smith’s) spent four months redesigning the space, which now includes hand-built swings and swing chairs (making it hard to tell how tipsy you really are), custom jungle print wallpaper, a spray-painted surf mural by local artist Camer1, and a bar and back bar refaced with shou sugi ban cypress from Delta Millworks in Austin, Texas (each piece of wood was specifically milled, burned, and then painted by hand). 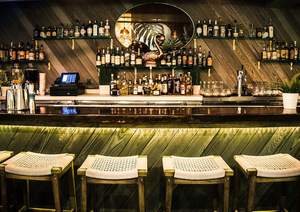 Of course there’s a tropical-inspired cocktail menu to match, including a 12-year aged rum mai tai and a Venezuelan rum old-fashioned, plus bowls for sharing and a daily slushie. Happy hour starts tomorrow (February 7th), running 5pm-8pm, plus DJs and dancing on the weekends. Sunday afternoons will be coming in the spring. 2125 Lombard St. at Fillmore. A name change in the local spirits world: with the sale of Anchor Brewing to Sapporo Holdings Limited, Anchor Distilling Co. is now Hotaling & Co. (the company relinquished the rights to the Anchor trademark). For those of you who know your SF history, the Hotaling name should be familiar: A.P. Hotaling, who came to San Francisco during the Gold Rush, was the largest liquor wholesaler in the West, and amazingly his whiskey warehouse didn’t burn down in the 1906 quake and fire—there is both a rhyme and a special Old Potrero release named Hotaling’s in honor of the booze miracle. You can read more (and learn the rhyme) in the press release here. Dennis Carr remains the company’s president and CEO, and Hotaling & Co. will also remain under the ownership of London’s Berry Bros. & Rudd and Tony Foglio. Big news in beer land: Jesse Friedman and Damian Fagan of Almanac Beer Co. just opened their brand-new 30,000-square-foot production brewery, barrel house, taproom, and HQ in Alameda. The Almanac Barrel House and Taproom will serve barrel-aged and fresh beers on-site (where they are brewed). There’s an indoor beer hall and an outdoor beer garden overlooking San Francisco Bay. Food is currently not available, but they will have food trucks most days, and outside food and deliveries are welcome. Kids are also welcome (supervised!) and so are dogs (on the outdoor patio only). Open Wed-Sat 12pm-8pm and Sun 12pm-6pm. 651B W Tower Ave. at Pan Am Way, Alameda Island.